Barrhead Housing Association is a locally-based provider of high quality, affordable, rented housing. 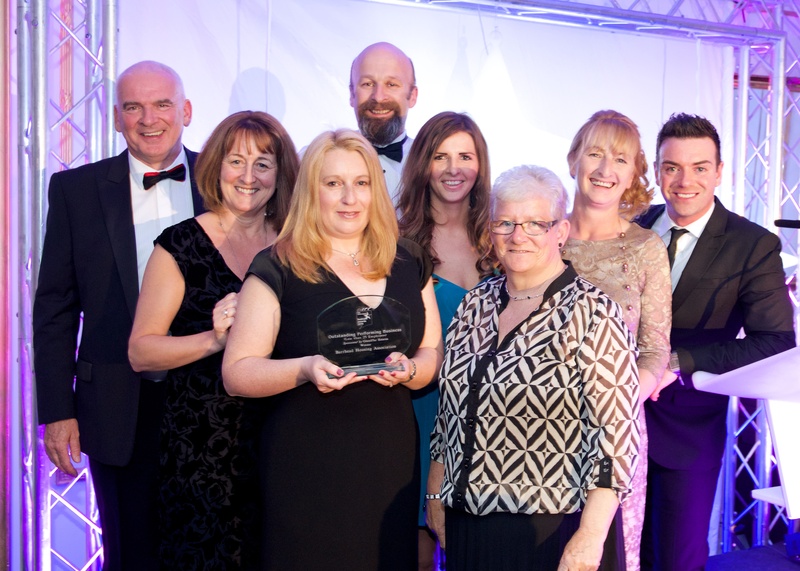 Proud to be awarded – East Renfrewshire Chamber of Commerce Outstanding Performing Business (less than 25 employees) 2014 – as sponsored by Gleniffer Estates – 5th June 2014 at the Dalmeny House Hotel. Set up as a registered social landlord in 1986, the Association’s initial aim was to improve the tenemental properties in the centre of Barrhead and we soon thereafter started a programme of building new properties for rent. Now the majority of our housing stock is new build. In 2001, we successfully transferred 245 homes from Scottish Homes and quickly completed the key improvements required, which included the demolition of properties in Auchenback – these have been replaced with new terraced houses and flats. In 2004 we became a registered Scottish charity. We are now a key locally controlled housing association owning nearly 920 properties through East Renfrewshire, although mainlly in Barrhead, Neilston, Newton Mearns and Thornliebank. This includes 15 new affordable homes that we built in 2016 in Darnley Road, Barrhead. The Association provides accommodation for general housing and also specialised housing including sheltered housing, wheelchair housing and housing for the elderly. We have 5 properties for shared ownership, a part-purchase/part-rental scheme. We participate in the Scottish Government’s ‘Mortgage to Rent’ scheme to help out owners faced with serious financial difficulties and are involved in a ‘Rent off the Shelf’ programme. The Association is run by a Governing Board made up of local tenants and residents, housing professionals, a local councillor, and local business people. As members of the Association, the governing Board is elected at the Association’s Annual General Meeting, usually held in August each year. The Governing Board meets 6 weekly to ensure that the Association is in control of its strategic direction, its commitments and services to tenants and residents. We currently employ over 20 staff members to carry out the operational activities of the Association. Levern Property Services Ltd is a subsidiary of Barrhead Housing Association (BHA) and is a company limited by Share. It was set up in November 2011 to become a commercial trading organisation with all profits being re-invested in Barrhead Housing Association. Barrhead Housing Association is the parent organisation, the only shareholder, with overall control of the subsidiary’s strategic, governance and operational activities. Levern Property Services has no geographical base and will consider services across but not exclusively to the East Renfrewshire local authority area. This non-charitable subsidiary’s purpose is to further the aims and objectives of Barrhead Housing Association in the most effective way and to minimise the Association’s exposure to tax liability through its factoring activities and, ultimately protect its charitable aims. for more information, please go to the sub-section opposite. Levern Property Services has an independent governing Board of 5 local people. Board meetings are every quarter. The appointment of Board members and the business plan are approved by Barrhead Housing Association’s Governing Board.